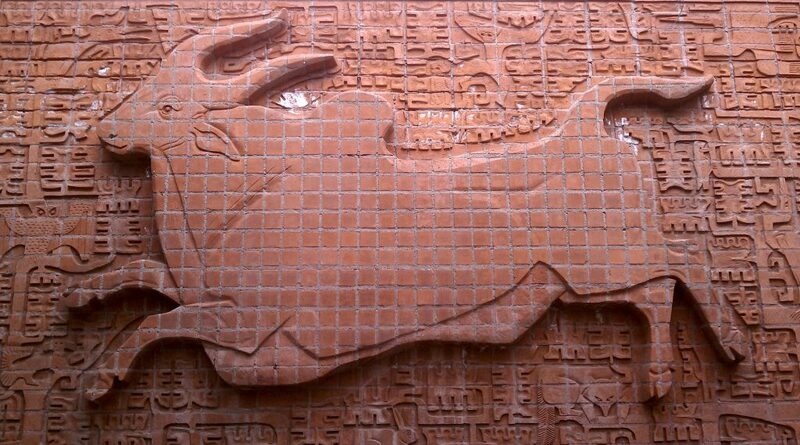 I know I have posted these mosaics before, in regard to dating and process… but classes have begun at UTEP this week. 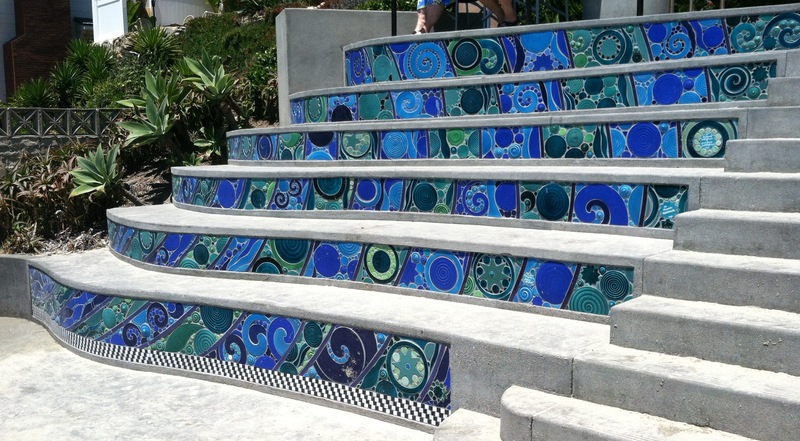 So, while I have some longer posts in the works and research questions out there, I just wanted to revisit another “home” branch for me, in San Diego — as I look forward to being there Labor Day weekend and checking on the status of the mosaics, sculpture, and paintings. Here, sailboats in the harbor compete with gulls diving after bread crumbs, the orcas of Sea World frolic on the left while fish and other creatures hang out in the tidepools at the right. Up the middle, the lighthouse of Cabrillo National Monument and the “world’s oldest active sailing ship,” the Star of India, highlight the centuries of European exploration and presence in the land of the Kumeyaay, but they wear their history lightly–the way I often found it, growing up in town, and the way many Home Savings art depicts it–just enough to make the local feel the bank belongs here, celebrating your home. More from San Diego and beyond in the weeks ahead — for now, grasp the last summer you can! The Star of India even has visitors this weekend for the Festival of Sail. 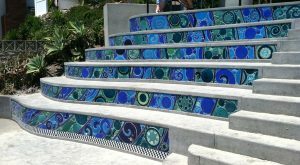 One of the fun summer activities here in southern California is the Festival of the Arts / Pageant of the Masters bonanza in Laguna Beach. I went as a child (and have seen it since copied on Gilmore Girls), but this year I had a chance to return thanks to spending a few days in the studio and around town with Marlo Bartels. As we have discussed, a number of artists were given Home Savings commissions in the final years of the art program, beyond just the Sheets Studio. Many of these locations are outside California, and often the local community does not know they are part of a larger series — hence they are even more threatened with destruction. Bartels’s work in Woodland Hills is threatened; I wonder whether his work for Home Savings in Thousand Oaks, Palm Desert (with Eric Johnson) and Monterey Park (with Astrid Preston); Pembroke Pines and Dunedin, Florida are associated much with his name or Home Savings. 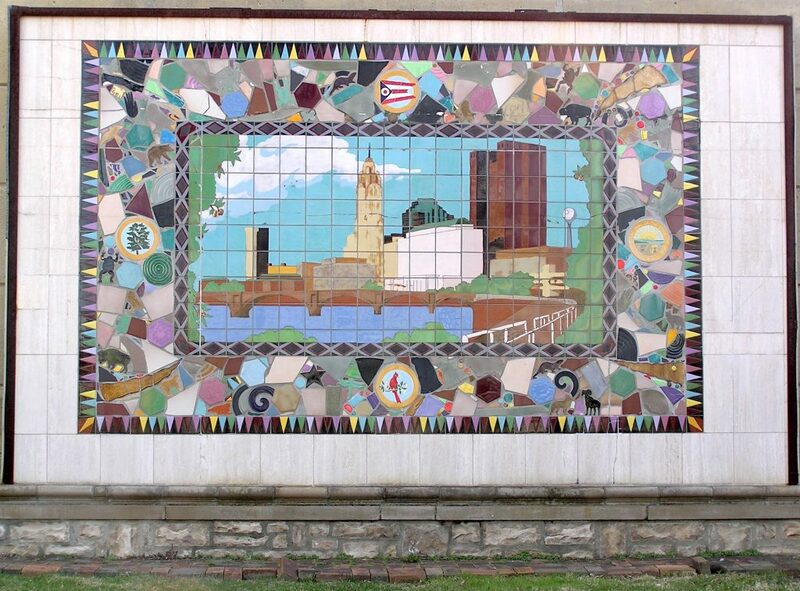 The large image you see above is of Marlo Bartels’s mosaic for Columbus, Ohio, in 1988; a mosaic by Denis O’Connor and Sue Hertel at 6280 Sawmill Road, in Dublin, Ohio, in 1990, is gone, showing how quickly these bank buildings, no longer built for permanence, can disappear. 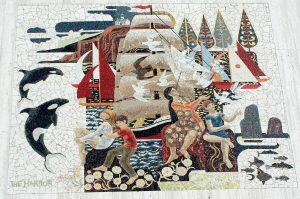 But the story of Marlo’s Columbus mosaic has a happy ending. As you can see, Marlo’s materials may be different, but he followed a rather standard Home Savings way of creating branch artwork — visit the city, look for something distinctive (the skyline), use local symbols and icons (Ohio state flag; state bird; local animals; shapes that echo those of the Moundbuilder peoples) and then put them into a permanent, colorfast material, such as ceramic, and hope to celebrate the community forever. 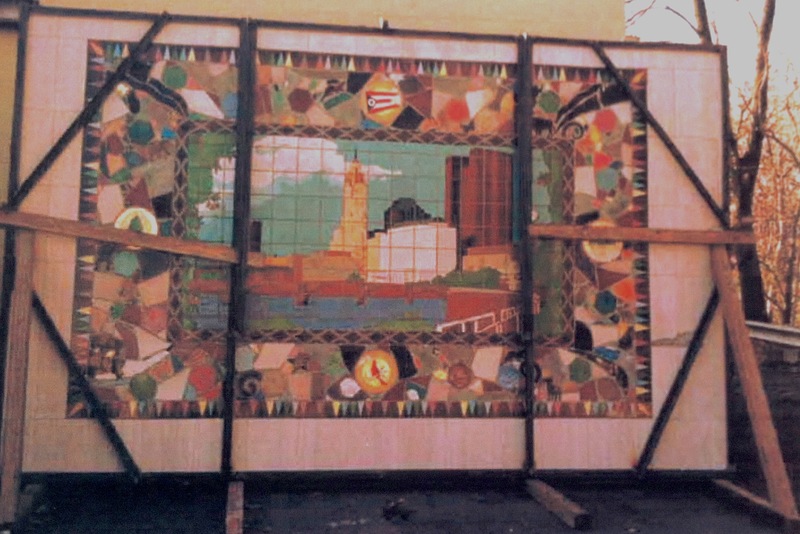 Marlo Bartels, Columbus mosaic ready for transport, 1992. Restoration was necessary in part due to vandals knocking over the transport. Image courtesy Marlo Bartels. 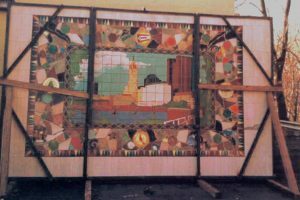 But in 1992, just four years after installation, the bank building was torn down (UPDATE: after it and the Graceland Shopping Center it was in were damaged in a fire) and the mosaic was threatened. Thankfully, the Casto Corporation (owner of the shopping center) was willing to help save the necessary wall, and Susan Gaunce of the local Clintonville Area Commission contacted Marlo and brought him to Columbus to help with the reinstallation and teach a few workshops. The mural then became the backdrop for the Gail Paris Discovery Garden at Clinton Elementary School. I have just heard from Shirley Hyatt, author of Clintonville and Beechwood, that Clinton had been closed for renovations, but when it opened for this school year — this week!–the tile mosaic is to be brought inside, so the kids can see and touch it more often–and where it can be protected, hopefully for decades to come. Thanks for Terry Miller and Shirley Hyatt for providing this image (and the updates). More of the move, the restoration work, or Marlo’s sessions in Columbus–or any of the outside-California locations–always welcomed! The timing of the LA County Fair is either brilliant or insane. A county fair is an icon of summer fun (away from the coasts), and the largest in the world is in Los Angeles — and it is held in September, when school is back in session and Halloween has taken over the store promotions. This either is a perfect extension of summer (and often the hottest days of the year here) or a crazy strategy. Either way, the LA County Fair is intimately tied to the work of Millard Sheets, and his circle of artists and friends in the Pomona Valley. Sheets won the first art competition at the fair, in 1922, at age (corrected) 15, in the year the Fair opened, and by 1924 he was assisting Theodore Modra in organizing the fair’s art exhibit. In 1931, after Modra died, Sheets was named Superintendent of the Art Department, and he guided the design and selection for the art exhibits at the Fair through 1957, including the 1954 Arts of Daily Living exhibit, which received national coverage and a visit from Frank Lloyd Wright as a celebration of the innovative modern way of decorating, including the artwork of John Edward Svenson, Harrison McIntosh, Jean and Arthur Ames, Sam Maloof, Betty Davenport Ford, Albert Stewart, Rupert Deese, Phil Dike, and others. Many from this circle (or their students at Scripps or the Claremont Graduate School) created the art for the Home Savings banks and other Sheets Studio commissions in the decades that followed. 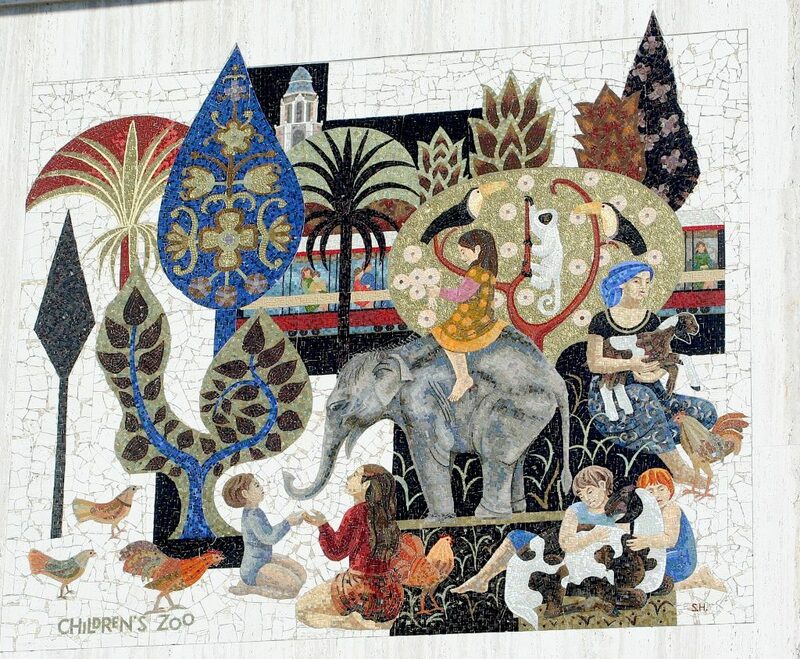 In 1994, the Fine Arts Building at the Fair was renamed as the Millard Sheets Gallery (now the Millard Sheets Center for the Arts at the LA County Fairplex, to be exact). Since 2007, Millard’s youngest son, Tony Sheets, has been directing the gallery and creating wonderful annual exhibits ever since. On Thursday, September 13, Tony Sheets will speak about the exhibit at a luncheon at Scripps College’s Malott Commons Hampton Room, organized by the Scripps College Fine Arts Foundation. Sounds like a wonderful opportunity — alas, I will be teaching that day in El Paso — but I recommend you grab a seat by contacting Marci Stewart at 909-985-8092. The Fair runs August 31 to September 30, Wednesday to Sunday. Perhaps I will see you there!